Forget due time. LibChat helps you answer questions in real time! One chat. Two chats. Claim chats. You chat. The LibAnswers Platform system with LibChat makes connecting with and serving your patrons so easy it's child's play. You'll marvel at how user-friendly the LibChat interface is and how it helps you expedite the process of answering questions. It all begins with your well-placed widgets. Create and embed them wherever you have visitors. The chat gets initiated and -- voila, you're connecting in a way that's growing more and more popular with people who have a question. Truly Customizable Widgets: Monitored by one person or the team. There are in-page, button pop-out, slide-out and floating widgets. 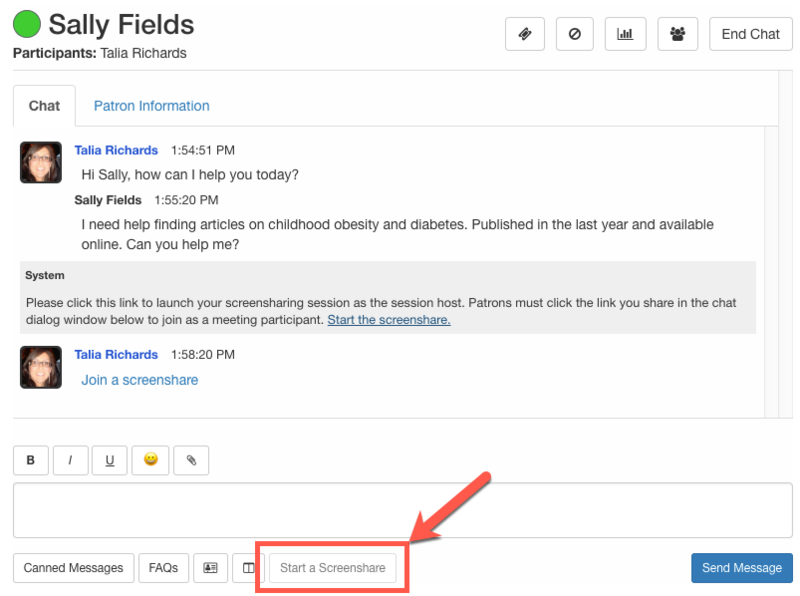 Set up fallbacks so if one department or person isn't online, LibChat will check the assigned fallback next. Proactive Chat: Specific widgets that can be set to pop/slide out automatically to let your patron know LibChat is available. Seamless Flow: If your visitor moves to other pages, the chat will follow. Send and receive files while chatting. Plus, LibChat works on all your devices. Transcripts and Ratings: Transcripts are available and are useful for training purposes and to learn from transactions with both positive and negative ratings. Operators/Transfers: Your chat operators will be able to navigate through the active chats easily. They can tag team with a colleague to help answer questions and even transfer questions to different people or departments. Want to chat internally? You can! Stats: Find helpful data that's filterable and exportable. Search for chats with a specific rating or that have a keyword and more. The LibChat Operator Interface is simple while featuring all the info you need. Our screensharing solution is more than just basic librarian-to-patron sharing of screens. Like, way, way more. Supported Across All Browsers - Whether you or the patron are using Chrome, Firefox, Safari, or some other browser... our screensharing works across all browsers. Supported Across Multiple Operating Systems - From Windows to Mac OS, from Ubuntu to Mint... we've got you covered. Works on Tablets & Mobile Devices - From Surface Pro 2 & (running Win 8.1 / Win 10) to iOS/Android devices and even Blackberry... you can screenshare with users on multiple device types. Audio & Video Options - You and the patron have the option to turn on your mics and webcams to enhance the screensharing experience. Multi-Person Webinars or Virtual Staff Meetings - Screenshare as a group for internal meetings, staff webinars, etc. Why should only two people have all the fun? Distance Education Support - With our screensharing and webinars, your library can better support distance ed programs at your institution. Saved Recordings - Optionally, save your screenshare session and share it with relevant parties. LibCal Integration - With LibCal's appointment scheduler integration you can easily launch virtual meetings with faculty and others who book consultations via LibCal.